Usulis (Arabic: الاصولية‎‎) are the majority Twelver Shi'a Muslim group. They differ from their now much smaller rival Akhbari group in favoring the use of ijtihad (i.e., reasoning) in the creation of new rules of fiqh; in assessing hadith to exclude traditions they believe unreliable; and in considering it obligatory to obey a mujtahid when seeking to determine Islamically correct behavior. Since the crushing of the Akhbaris in the late 18th century, it has been the dominant school of Twelver Shi'a and now forms an overwhelming majority within the Twelver Shia denomination. 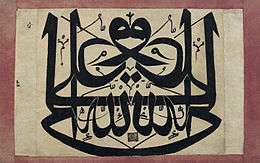 The name Usuli derives from the term Uṣūl al-fiqh (principles of jurisprudence). In Usuli thought, there are four valid sources of law: the Quran, hadith, ijma' and 'aql. Ijma' refers to a unanimous consensus. Aql, in Shia jurisprudence, is applied to four practical principles which are applied when other religious proofs are not applicable::284-5 bara'at (immunity), ihtiyat (recommended precautions), takhyir (selection), and istishab (the presumption of continuity in the previous state). The Usuli believe that the Hadith collections contained traditions of varying degrees of reliability, and that critical analysis was necessary to assess their authority. In contrast the Akhbari believe that the sole sources of law are the Qur'an and the Hadith, in particular the Four Books accepted by the Shia: everything in these sources is in principle reliable, and outside them there was no authority competent to enact or deduce further legal rules. In addition to assessing the reliability of the Hadith, Usuli believe the task of the legal scholar is to establish intellectual principles of general application (Usul al-fiqh), from which particular rules may be derived by way of deduction. Accordingly, Usuli legal scholarship has the tools in principle for resolving new situations that are not already addressed in Quran or Hadith (see Ijtihad). Taqlid has been introduced by scholars who felt that Quranic verses and traditions were not enough and that ulama were needed not only to interpret the Quran and Sunna but to make "new rulings to respond to new challenges and push the boundaries of Shia law in new directions." By their debates and books, Al-Mufid, Sayyid-al Murtada, and Shaykh al-Tusi in Iraq, were the first to introduce the Uṣūl al-fiqh (principles of Islamic jurisprudence) under the influence of the Shafe'i and Mu'tazili doctrines. Al-Kulayni, in Rey, and al-Sadduq, in Qom, were concerned with a traditionalist approach. The second wave of the Usuli was shaped in the Mongol period when al-Hilli introduced the term mujtahid, meaning an individual qualified to deduce ordinances on the basis of authentic religious arguments. By developing the theory of the usul, al-Hilli introduced more legal and logical norms which extended the meaning of the usul beyond the four principle sources. Amili was the first scholar to fully formulate the principles of ijtihad. 1 2 3 Nasr, Seyyed Vali Reza; Dabashi, Hamid; Nasr, Seyyed Hossein (1989). Expectation of the Millennium: Shi'ism in History. State University of New York Press. ISBN 0887068448. 1 2 Momen, Moojan (1985). An introduction to Shi’i Islam : the history and doctrines of Twelver Shi’ism. Oxford: George Ronald. ISBN 0-85398-201-5. ↑ Nasr, Vali (2006). The Shia Revival: How Conflicts within Islam will shape the Future. Norton. p. 69. ISBN 0-393-06211-2. Newman, Andrew J. (1992). "The Nature of the Akhbārī/Uṣūlī Dispute in Late Ṣafawid Iran. Part 1: 'Abdallāh al-Samāhijī's "Munyat al-Mumārisīn". Bulletin of the School of Oriental and African Studies. University of London. 55 (1): 22–51. doi:10.1017/s0041977x00002639. JSTOR 620475.